This base metal money clip has two free form turquoise stones set in sterling silver bezel and has a sterling silver cast eagle. Money clip measures just over 2" long by 3/4" wide. It is Navajo crafted by Sally Arviso. 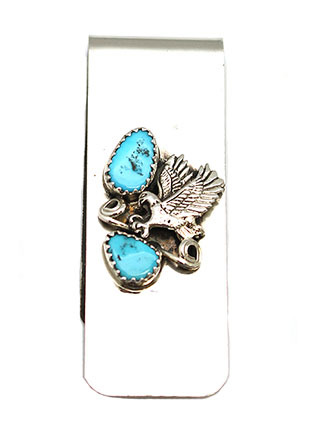 Stones will vary in shape and size and may even vary in kind of turquoise used.